On Tuesday, Barnes & Noble unveiled the latest addition to its Nook ereaders, a full-color touch screen version called Nook Color. The device has a 7-inch color touch display, Wi-Fi only connectivity, 8 GB of memory, and weighs less than a pound. It runs on Google’s Android operating system and allows users to listen to music, play games, and surf the web. It will retail for $249. In contrast, Amazon’s black and white, Wi-Fi only Kindle is $139. Barnes & Noble previously allowed Nook owners to lend books, but the new LendMe™ App takes this feature even further by enabling Nook Color users to view LendMe books in their friends’ Nook Color digital libraries and request to borrow a title they’ve been meaning to read. Customers have the ability to easily lend their favorite books with friends through Facebook and e-mail, even using their imported Google® Gmail™ contacts, and recommend a title, share reading status or a quote via Facebook, Twitter and e-mail. 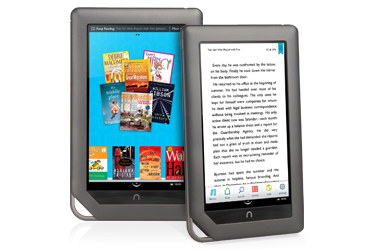 Nook Color is available for pre-order for $249 and is expected to begin shipping on or about November 19. Check out Nook Color today at www.NOOKcolor.com or at the NOOK Boutiques and displays in one of Barnes & Noble’s more than 700 bookstores beginning in late November. NOOKcolor, along with NOOK 3G and NOOK Wi-Fi, will also be available at Best Buy, www.bestbuy.com, Walmart and www.walmart.com, and Books-A-Million in late November.